How to Size up or Down for Your Perfect Fit! Today, I'll be sharing with you an easy trick I learned back when I worked for Ann Taylor Loft and that's how to select pieces in the opposite category of your height or frame! First, I want you to take a look at the tweed jacket I'm wearing. Would you believe that this 5'8 long armed girl is wearing a petite jacket?! Yes, this jacket is a 6P and you couldn't even tell by looking at the arm and waist length now could you? My husband and I were walking around a street fair a few years ago, where all the local boutiques had their clearance items hung on racks outside their shops. While walking by, my husband spotted this jacket (double brownies points) and wanted to gift it to me, but after looking at the size, he thought his hopes of making my day with this lovely jacket were done, until I explained to him what I had learned from working retail, as I tried on the jacket that fit perfectly! We all know how the story ends, since I'm wearing this lovely jacket today! Did you enjoy my little Cinderella story?! So dramatic, I know, haha! So here's what you need to know. If you shop in the average section, which simply means average height, not size, then you'd go up roughly two sizes in petites for a comfortable and flattering fit. If, on the other hand, you are petite, generally speaking, you'd go down about two sizes, so the piece fits you comfortably. I remember those days when I'd be assisting clients who would fall in love with a specific piece from our collection and would be SO disappointed when it wasn't available in their size, especially when I would check the back and computer system to see if other locations had it to no avail. I don't know if things have changed in the employee training and process these days at The Loft, but we had to go through constant training both on the computer and in store, without knowing or preparing in advanced. Our shift manager would simply gather us, tell us a style related scenario that we may face with a client and gave us 5 minutes to create an outfit that was practical for that situation! Let's just say I knew where everything was in the store, haha! Anyway, we were taught the method of sizing up or down according to frames and that's how I learned the technique and would feel SO great when I'd suggest this to our clients and they would walk away with that favorite dress or top! I hope you found the tips I shared here helpful the next time you're shopping and are in love with something that's only available in one frame category! I also want to mention that this method also applies to plus sizes, too. I often get questions either on Facebook or YouTube where women mistake body shapes and frames for sizing, which are completely different! 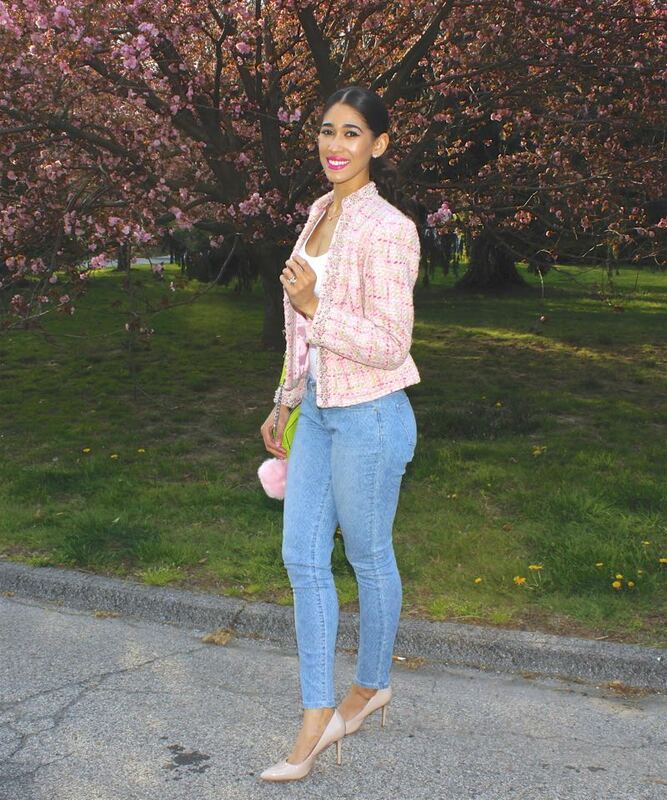 I also hope that you liked my outfit and feel inspired to recreate it, tweed in pastel colors are so chic, sophisticated and can be styled in so many ways! Have an amazing weekend, my dear friends, and thanks so much for stopping by, see you all here again Monday morning! Next: Cool in Citron Previous: Shake Your Pom Pom, Shake Your Pom Pom!